I made an error earlier, I said this was intended for Action 635. In fact, it was for 642. I had assumed it was the earlier of the two crossover issues, simply based on the line-up that appears in the story – none of the post-635 series are included. But the ending makes it clear that it was for the latter issue. Neil Gaiman’s script was rejected by John Byrne. 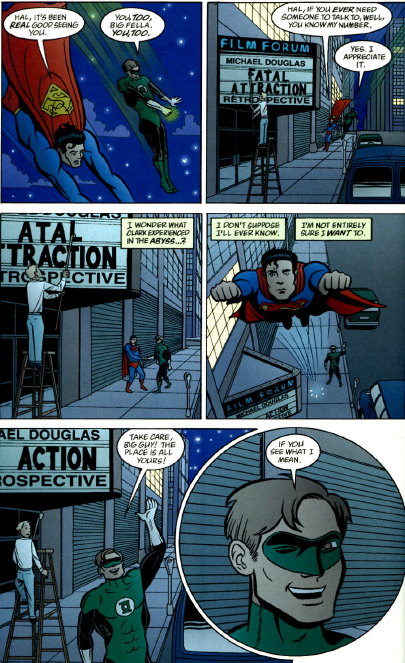 At the time, it was a hard and fast rule that no one knew Superman’s identity, and Gaiman insisted on the characters meeting as Clark and Hal. Neither would budge, and the script got set aside. The story was finally published in 2001. This special also has a large art team, divided chapter by chapter. Eddie Campbell, Mark Buckingham, John Totleben, Jim Aparo, Kevin Nowlan, Jaosn Little, Michael Allred, Eric Shanower, Terry Austin and Arthur Adams. The story begins with a prologue in Berlin, shortly after the end of World War II. Blackhawks Janos Prohaska and Weng Chan go rooting through rubble, searching for a lost weapon. They come across the remains of the Justice Society of America, although they do not realize who these people are. 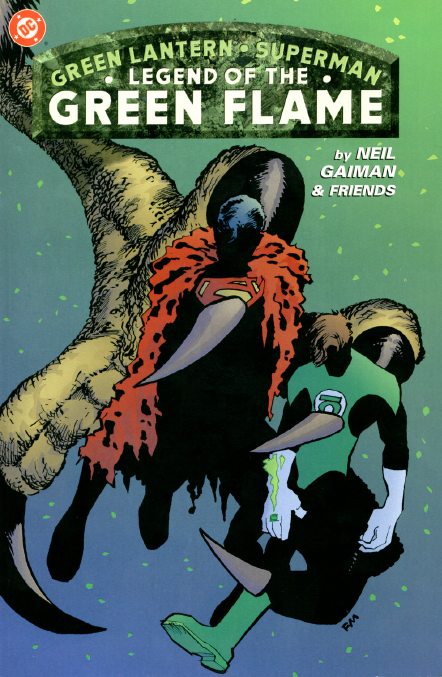 We see Sandman, and the remains of Hawkman’s wings, but it’s Alan Scott’s lantern that grabs Weng’s interest, and he takes it with him. 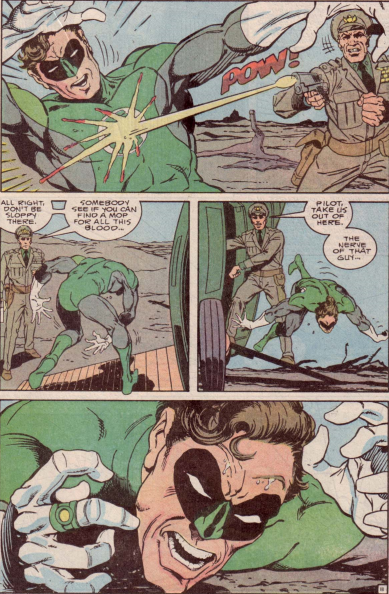 Jumping to the present day, Hal is feeling lost and alone, and turns to Clark for a shoulder to cry on. 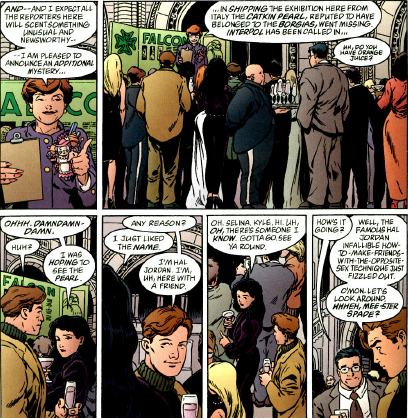 Lois Lane wrangles the two into attending a gallery opening that night. 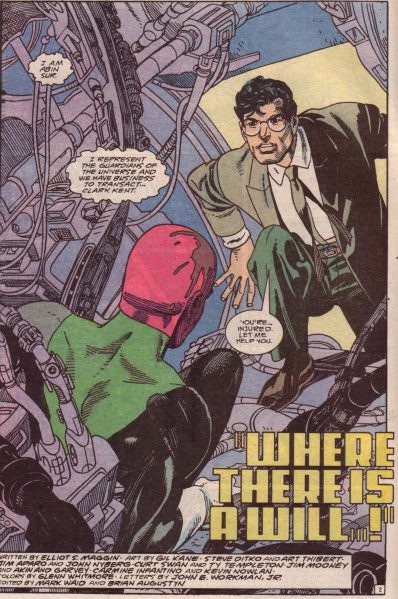 Catwoman makes a cameo, running into Hal. But the catkin emerald she was interested in is not there, so Selina leaves. Exploring the gallery, Hal comes across the lantern, on display. He is fascinated. It’s a Green Lantern lantern, but not one he recognizes. He uses his ring to scan it. Deadman comes across the confused heroes, and tells them they are dead. They aren’t. Not quite. But they have been pulled into the magical, somewhat sentient flame that powers Alan Scott’s lantern, and are between being alive and dead. 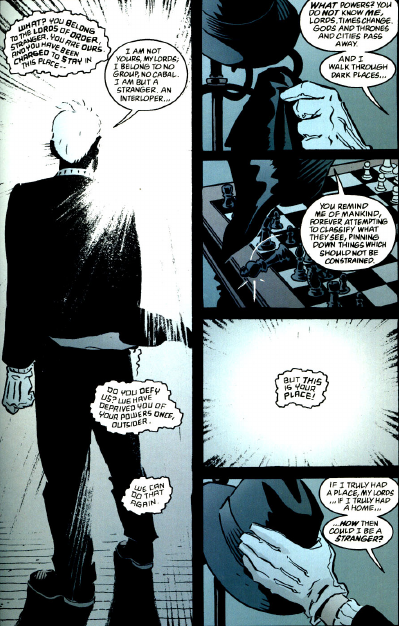 The Flame’s burst of energy draws the attention of the Phantom Stranger. He convinces Hal that he does have the willpower to tame the wild magic of the flame, and get it back into its battery, dormant. The final page makes it clear that this was intended for issue 642. The story printed there uses a similar marquee in its background. 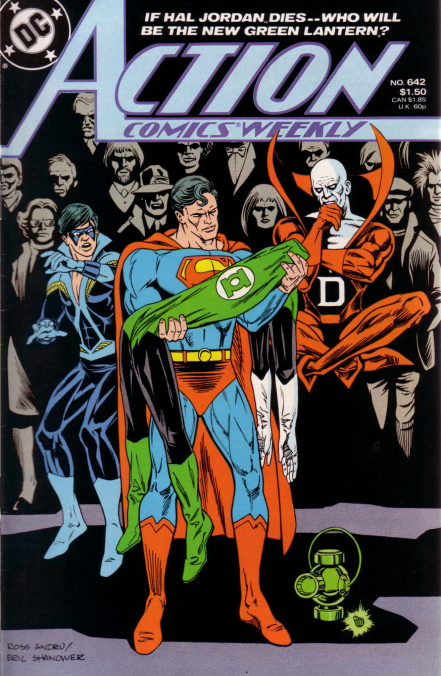 Action Comics Weekly comes to an end with issue 642, a full-length crossover story. 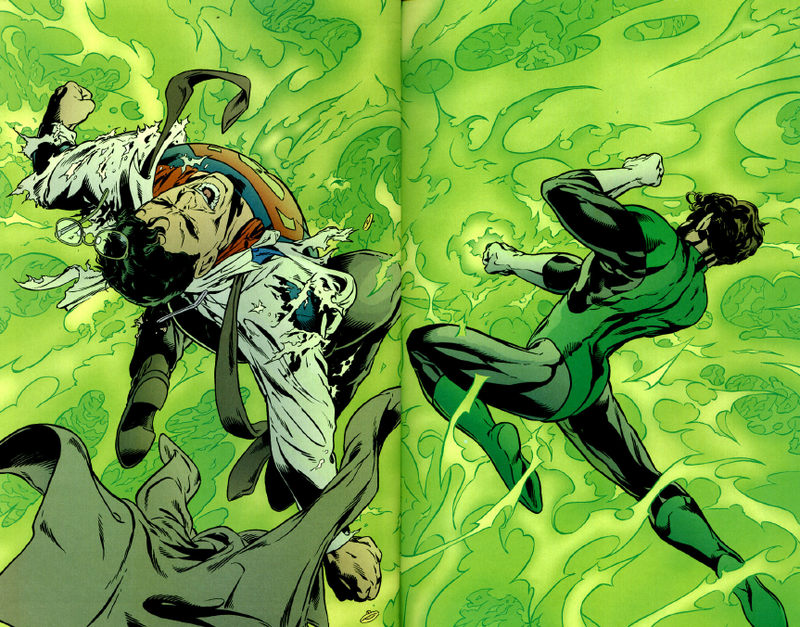 Superman, Green Lantern, Nightwing and Deadman are all involved, as well as Guy Gardner. Elliot S Maggin scripts this tale, which opens with a flashback to the death of Abin Sur, and his selection of Hal Jordan as successor. In this version, we learn that Clark Kent was brought as a possible Lantern, but declined. The art changes from chapter to chapter. 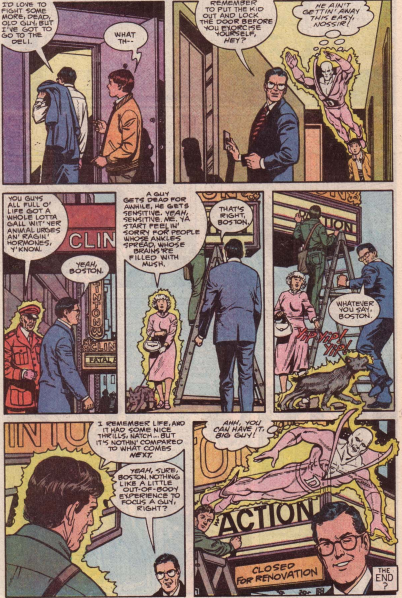 The various creative teams are: Gil Kane, Steve Ditko and Art Thibert, Jim Aparo and John Nyberg, Curt Swan and Ty Templeton, Jim Mooney with Ian Akin and Keith Garvey, and Carmine Infantino and Kevin Nowlan. Green Lantern is investigating an unusual military installation. 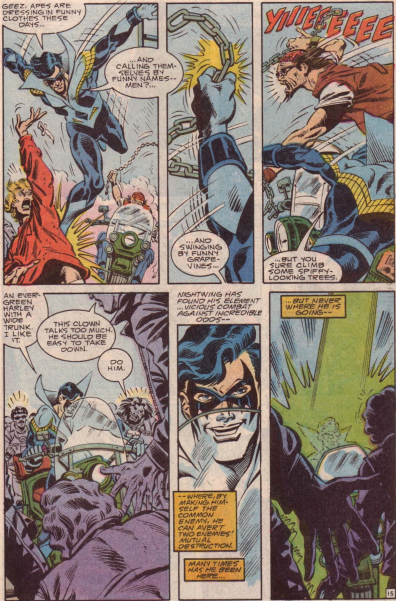 The man in charge wants no spying eyes, and shoots Hal right in the chest. 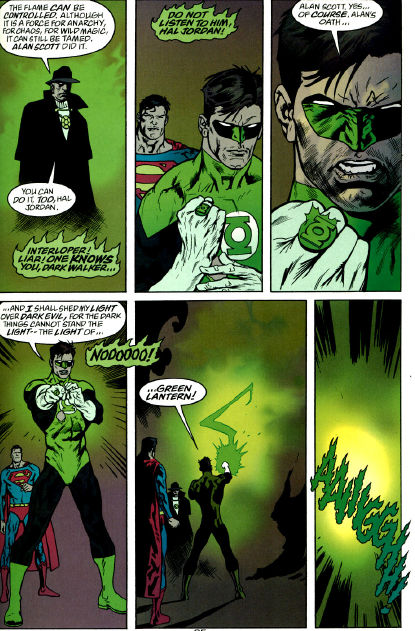 Hal lays dying, and his ring summons potential successors. It might summon a doctor as well, but apparently has given up on Hal. Most of those chosen are not characters we know, have ever seen before, or will ever see again. 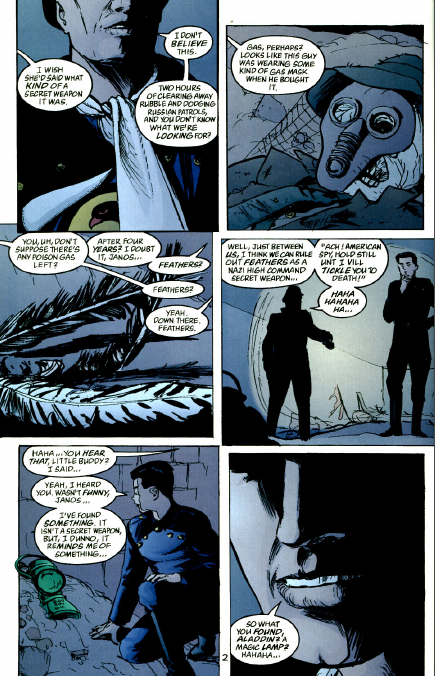 Clark Kent is brought again, as is Nightwing. Guy Gardner is selected as well, completely nonsensically. 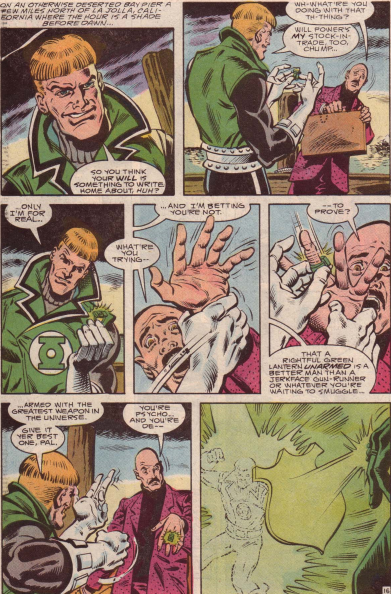 He has removed his ring temporarily, and the story treats this as if it means he is no longer a Green Lantern the second he takes off the ring, despite the mental connection between the ring and its wearer. Deadman comes to see what all the fuss is about. This is all taking place in a millisecond. 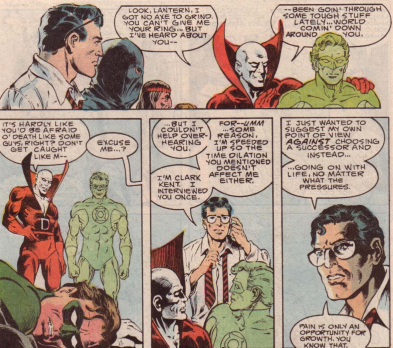 Deadman is able to converse somewhat with Hal, which makes sense. 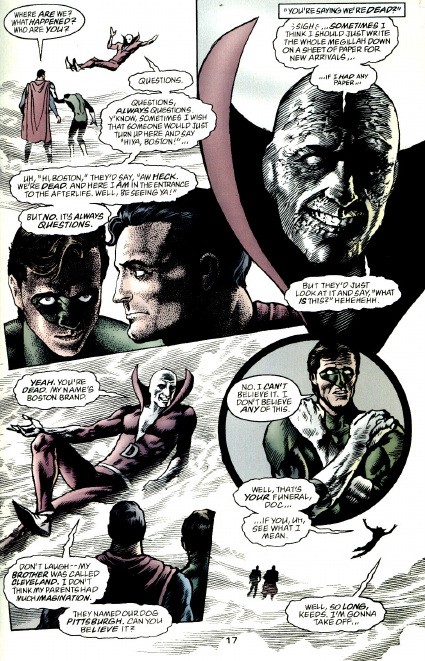 Superman can also communicate with Deadman, because he can sense this all happening at great speed. That really doesn’t explain why he can see Deadman at this event, but not in normal situations. You can tell from the way I am picking at it that I did not enjoy this story. There was no likelihood that Hal was going to die, so the story was just pointless. That might have been ok if it were a lot of fun on the road, but it’s not. And so these weird errors, just sloppy writing by someone who can, and has done, better, annoy me. 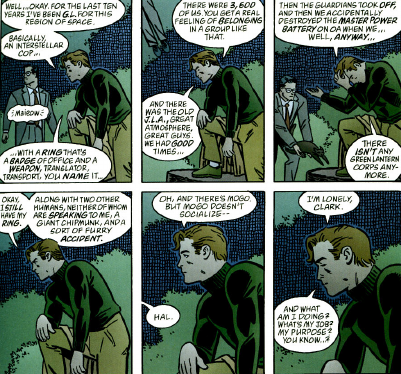 After a lot of “what if this guy became Green Lantern?” Hal revives, and everyone is returned to what they were doing before. About the only touch I like is the theatre marquee being changed in the final panel, reading Action – closed for renovations. Action Comics returns in a few months, with an second annual to launch its return to a regular format. And there is still just enough room on this blog that I can do an entry on the Neil Gaiman Action Comics Weekly story that never was.